In many ways this could play on the theme of confusion and identity. Yabba notices that her siblings are called ‘my child’ by Maami. Yet Yabba isn’t. It would be a confusing time for such a young girl. Who is trying to figure out who she might be. Maami for most of the story is a tough person who does not entertain Yabba or her way of life. She sees no point in it and would prefer for Yabba to work at home. To help her mother around the home. Yabba on the other hand is a free spirit who is not easily caged. Something that is clear by the fact that the Big Trunk is her favourite and constant playing area. If anything Yabba is a free girl. Free to live her life as she sees fit and to enjoy it too. She sees no sense in being stuck with Maami when she can play with the other children by the Big Trunk. An issue which Maami frowns upon and which might dictate her decision as to why she doesn’t call Yabba ‘my child.’ In fact all that Yabba is doing is rebelling against Maami. As many children of Yabba’s age might do when it comes to listening to their mothers. What is also interesting about the story is the fact that Yabba is acutely aware of the pain she feels by not having Maami call her ‘my child.’ It is as though Yabba wants to be part of her mother’s family like her siblings are. Something which can be very tough on a young child. To not be part of a family. This would play on the theme of identity and who a person thinks they might be. Yabba knows that she is a young playful girl but she doesn’t know if her mother is her mother or if she loves Yabba. An issue which again can only cause confusion for a child. To not know where they might come from. Despite this Yabba is still a good-natured child and wants to help Maami by getting her some red soil. She believes that by doing so she will earn Maami’s affection. However things do not go as planned for Yabba and she is beaten in the middle of the night while she retrieves the hoe because the family think that she is a thief. The end of the story is also interesting as Maami finally calls Yabba ‘my child.’ She can see that Yabba was only trying to help her and that Yabba is not all bad. Any misunderstanding that Maami had about Yabba is gone. There is also a sense of connection while Maami is holding Yabba. A bond that was not previously there has been formed. Maami wants to take care of Yabba because she knows she is sick and tells Yabba’s friends that Yabba cannot go and get the red soil with them. 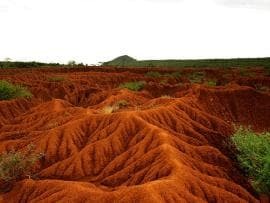 The red soil may also be symbolically significant as some traditions believe man (and woman) come from the earth. By having Maami being proud of Yabba’s intentions they are both brought together by the single act of Yabba wanting to help get the red soil in order to help her mother. By ending the story with a resolution Aidoo manages to leave the reader thinking as though all familial conflicts can be resolved. All it takes is a bit of wisdom and love. McManus, Dermot. "The Late Bud by Ama Ata Aidoo." The Sitting Bee. The Sitting Bee, 11 Apr. 2019. Web.